Excellent article. If Chinese companies were to distance themselves from the need to use Chinese (Pinyin) names in branding, they could be much more successful in the short term. There is an implied quality issue with products associated with China. The exception to this is with foreign brands, I think that most consumers (right or wrong) believe there are stricter standards in the manufacture of foreign branded products in China. So the implied association of poor quality with China managed companies will take some years to overcome. In 20 years, it may look quite different, however that is the reality now. The flip side: with potentially the largest domestic market in the world, do they really care? Very good point of Pinyin names in branding. This is key issue, which merits deeper analysis by more knowledgeable people in this field. Admittedly, the niche of linguistics within branding is not one of my areas of expertise. I believe that the perception of poor quality is a myth that will change over time. China makes good products as the norm, (despite some highly publicized exceptions), and without good quality products, China’s exports would not have grown to current levels. In the 1960s and 70s, average U.S. consumers considered Japanese products be inexpensive and low quality. This has changed, as it will in China. The point about the Chinese domestic market is very interesting. Hypothetically, without exports to fuel domestic spending, would China be as big of a market? Good food for thought. Thanks for the comment. Ray, your views are so typically “western”, i.e. self-centered and short-sighted. You forget that China has only re-emerged onto the global scene in the early 80’s after over decades of self-exile from the world community and wrenching internal turmoil. That it now commands a dominant position in global manufacturing is a testament to its tenacity and potential. You are wrong – branding is NOT just a matter of marketing; it is first and foremost, a matter of quality – quality of design and quality of manufacturing. China has mastered the latter and is well on its way to master the former. Marketing is last on the value chain involving research, positioning and promotion – soft sciences and arguably the easiest to master. Ask yourself, can U.S. make half of what China makes today? And despite their branding prowess, how well do American-made cars sell in Germany, Japan, or anywhere else for that matter? As for global brand recognition, I’m sure even you have heard of Sinopec, Bank of China, and Suntech (the largest solar panel manufacturer in the world.) Give China another 10 years and the Jili’s, Haier’s and whatyoumightcallit’s will be household names. Not all of them will roll off western tongues as well as Dell and Cisco. But then again, maybe by then the lingua-franca will be Chinese, not English. Some valid criticism here. No, I am not Chinese. I am American, so yes, my views could be simply labeled as “typically Western”, however you may define it. I agree that western business can be described as comparatively “short-sighted” versus China or Japan. Note that I did not say that brand is JUST a matter of marketing. [I wrote, “Brand is a matter of marketing. Brand is a matter of perception. Brand is a matter of purchasing decisions. Brand is a matter of global competition.”] All of these things — and more — play a part in branding. I agree that quality can be an important element of branding. In the U.S., a perfect example would be Firestone Tires, whose brand was literally destroyed by poor quality design and manufacturing that killed dozens of people. However, quality is only part of a brand, and in some cases, it is not a central part of the brand. All of these brands will claim to provide “good quality” products and services. However, what they REALLY represent to the consumer (“the brand”) does not always need to scream “quality” to be successful. Is Kinko’s successful because they offer the best quality photocopies in the world? How did Ryan Air become successful? Cheap flights. Oh, yes, when I want to dazzle a client with high quality, I sport a Bic pen in the pocket of my shirt that I bought at Walmart. Yes, China has more manufacturing capacity… Great for exporting foreign-branded products. Yes, American cars are not the best selling in the world… Japan is way ahead. I’m still waiting to see a Chinese car on the road in the U.S. or Europe. Yes, marketing is a soft science… but if it is “the easiest to master”, then why doesn’t China just build their own export brands, instead of selling under foreign brands? Yes, I’ve heard of Sinopec, Bank of China, and Suntech… but the average American, Italian or Brazilian consumers would not recognize these brands. Coca-Cola, BMW, Sony, Microsoft, Nike — Mega-brands that are recognized worldwide. Until China adds a name to this list, it will continue to fall short on global branding. By the way, I have extended Chinese family, business ties many good friends in China, so please do not assume that I am “anti-Chinese.” You may continue to see me as short-sighted, perhaps even ignorant… and I appreciate your taking the time to open my eyes to your differing opinions. Thanks a lot for sharing the wonderful insights on this article. I love it! What a thought-provoking article! I had mixed feelings after reading it. I love my home country China dearly, but have mixed feeling of love and compassion. However, born and raised in China, educated in the US, I considered myself an international Chinese, a global citizen. I don’t wanna be a self-centered and narrow-minded Chinese Chinese, so I have to say that I agreed a lot of things you said. It’s sad but so true sometimes. There is a Chinese saying that “a foreign moon is always rounder”. 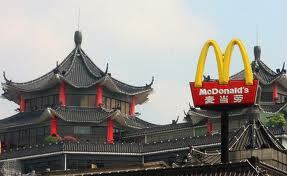 Even alots Chinese much prefer American brands over Chinese brands too. Hence, it is really important for Chinese to replace the words “make in China” with “designed in China”. I truly believe that it will happen in the near further. Japan went through the same issue. Decades ago, Americans thought that Japanese brands represent very low quality, but this perception changes nowadays. China has a long way to go. Again thank you so much for sharing your wonderful insights and assisting me in job searching in the US. It might be too late to call you today but I’m really looking forward to talk to you soon.